Some videos are now online! As I mentioned previously, at this year's first annual zomBcon, much to my surprise, I found myself moderating and leading a panel with George Romero. Ostensibly, the panel was meant to consist of George, myself, and two other panelists. 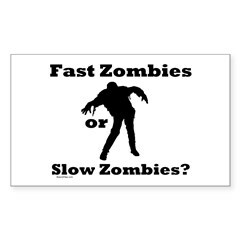 The topic of conversation was slated as "fast vs. slow zombies". If you're unfamiliar with this terminology, the fast/slow zombie issue is a big one in zombie cinema. The original Romero zombies (or, as he calls them, the "living dead") from his Night of the Living Dead were very slow moving. As he explained, this is because... well... they were dead. Rigor mortis and all. Of course they would be slow. For many, the draw to the zombie genre is the very fact that no one zombie is necessarily scary. They're easy to kill, easy to outrun, and easy to outwit. The horror in zombie movies are the sheer numbers involved. There are hundreds, if not thousands of these dumb, slow moving, relentless creatures that have no desire and no will, just the need to feed. National Geographic's The Truth Behind Zombies (with yours truly!) goes into all of this stuff in some detail. Now, in 1985, Dan O'Bannon (writer on Alien and Heavy Metal, effects specialist for Star Wars) made Return of the Living Dead. This somewhat horror, somewhat (now) comedy introduced the slightly more intelligent, faster, more coordinated zombie. While this movie is often most famous for Linnea Quigley's dance scene (googling this is NSFW), it also co-stars MST3K favorite, Clu Gulager (Clu Gulager alert!). Back to the panel. What ended up happening was that George showed up a bit late while a few hundred people waited and I paced around up front. The other panelists never arrived, so it was just me on stage with Mr. Zombie himself. In the end I pulled up the rest of the zombie "brain trust" to help me out: Tim Verstynen and Steve Schlozman. We talked a bit about zombie neuroscience, video games, cinema, etc. It was very informal, and a lot of fun. Looks like someone filmed the whole thing, too! The audio quality isn't great, but if you turn up the volume you can hear it decently well. along with parts two, three, four, and five. Great to see my fave director and neuroscientist together!